In the past, Valentine’s Day hasn’t received much attention in the decorating department around here. It always seems to sneak up on me. At the last minute, I’ll start throwing hearts around attempting to make it a little bit festive. It seems this year will be no exception. I had BIG plans, but now we’re three day’s away and enthusiasm for creating anything new is almost nonexistent. Lucky for me I’ve picked up a few vintage Valentine’s over the past year to help me out. I think their adorable, just the thing to add a touch of Valentine spirit. I tucked them in around my hutch, along with a few things I had in storage and called it done. 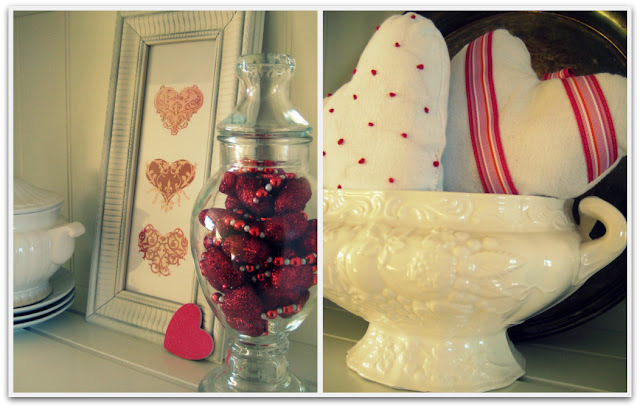 Framed rub-on hearts, a jar of heart garland and a few hearts I made last year completes the look. Well it doesn't look like something you threw together at the last minute. Everything looks really cute! The rub on hearts in a frame is a great idea! Just the right touch of Valentine's Day! Your hutch looks beautiful...crisp and white! I love the way you have arranged the vintage Valentines and isn't it great to get old pieces of furniture and redo and reuse. It is so rewarding to make something lovely out of something old and used. I love visiting your blog. 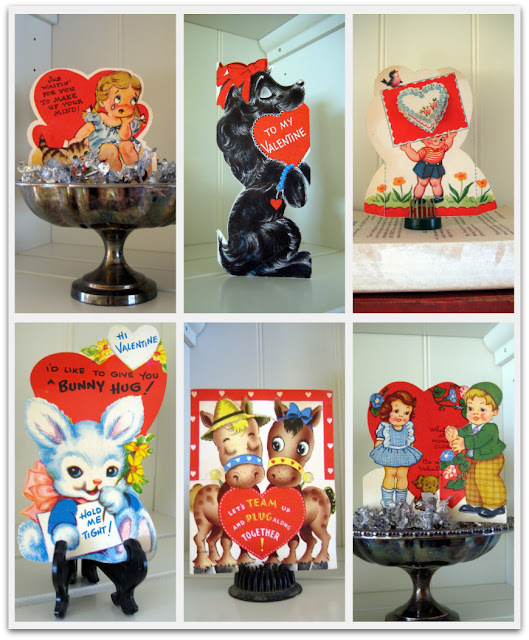 Come check out my vintage Valentines I made and have displayed on my blog.